Master carver Abdul Aziz Mohamadu designs this stunning wall mask featuring Igbo stylizations. Mohamadu call his original design Udo, meaning "peace." 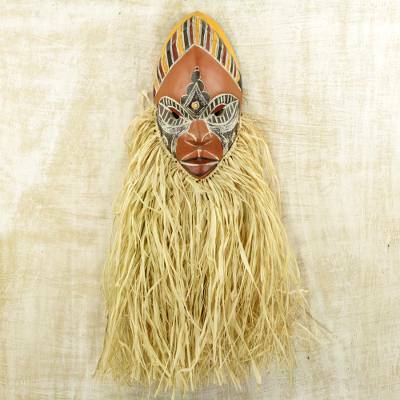 In the tradition of Igbo dance masks, this one is carved by hand of rubberwood and lavishly adorned with a raffia beard. The face is adorned with ornately embossed aluminum plates as well as painted details. Applications of clay are used to give the wall mask the appearance of an aged piece. "One of my favorite art treasures." This mask adorns the wall in my living room and welcomes all guests with his gorgeous presence.